Find your next sport horse at Miari Stables! Our Mission: To provide the dressage community with high quality sport horses! Our emphasis is on breeding for temperament, movement, soundness, and ability to perform. We use the world’s top sires, and cross them on our bloodstock approved, and proven producing broodmares. 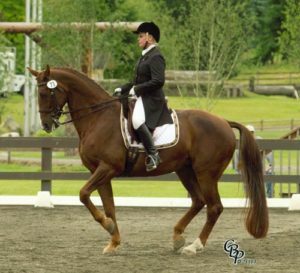 We breed primarily warmbloods, but also some German Riding Pony/Warmblood crosses, and some Half-Arabian/Warmblood crosses for those riders looking for a smaller horse, but not a pony. Whether you are a professional, adult amateur, or a junior rider, we hope you find your next horse here at Miari Stables. Coming to see what we have to offer: After reviewing the video, seeing the photos and talking frankly with Kari about your needs and wishes, you may make an appointment to come see what interests you–we may have more than one horse to fit your needs. Miari Stables is located in Tumwater, Washington, an easy one hour south of the Seattle/Tacoma Airport, and two hours north of the Portland, Oregon airport, just 5 minutes off the I-5 corridor. We have many hotels minutes from the barn, lots of nearby great food, beautiful sights, and even a tack shop should you wish to spend the night and see the horses a second day. Now you want to buy your horse: We make it easy for you! We are happy to help with as much, or as little as you would like. We have several equine sport knowledgeable vets in our area. We can provide their names and numbers for you to set up the vetting. We are happy to host the vet and handle the horse, if you can not be here. All Miari horses are registered with their appropriate breed registry, and their papers and USEF lifetime registration, and in some cases, USDF lifetime registration is included in their price. After a successful vetting, funds and ownership are transferred simultaneously. Now you may bring your new horse home! You may pick up your horse at Miari or have a transport service do it for you. We will meet the shippers to help load your horse. Transition: Some riders bring their horses home, others leave their horse at Miari for additional boarding, training, or lessons before making the trek home and settling into a new place. Either way, we are happy to have a conference with you and your trainer to be completely informed. We also love to get updates, photos, and show results of Miari horses and their new lives, so please feel free to stay in touch! We currently have 14 Yearlings for sale. We currently have 13 2yr olds for sale. We currently have 7 horses under saddle for sale.